Sam Sunderland and Luciano Benavides will soon head to Abu Dhabi in the United Arab Emirates to contest round one of the 2019 FIM Cross-Country Rallies World Championship – a five-stage event held in the dunes to the south of the UAE’s capital city. 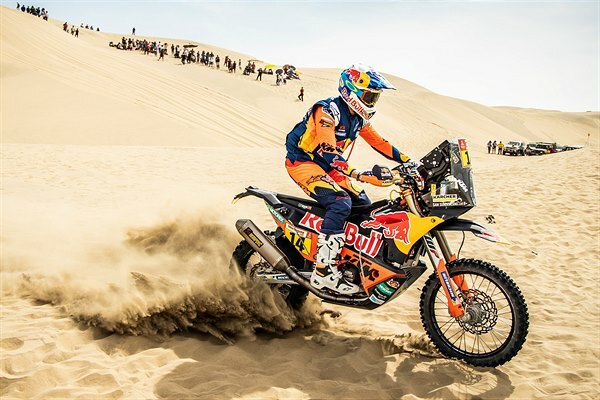 Fully rested following January’s gruelling 10-day Dakar Rally, Red Bull KTM Factory Racing will continue their 2019 race program with a two-rider team competing in the Abu Dhabi Desert Challenge. The event, now in its 29th edition, marks the start of this year’s world championship. Faced with five days of racing, totalling over 2,000 kilometres, riders and their machines will be tested to their limits in the dunes of the Liwa Desert. Following on from his Dakar podium success, Sam Sunderland has kept himself busy in the months leading up to the opening round of the FIM Cross-Country Rallies World Championship. As well as training onboard his KTM 450 RALLY, the Brit has also raced a variety of off-road events around the globe, including enduro and supercross. The team’s junior member, Luciano Benavides, went from strength-to-strength at the 2019 Dakar Rally, finishing in a strong eighth place overall in only his second year at the event. Benavides put in an impressive performance over the course of the race, making few mistakes and steadily improving his pace as the race progressed. Riding in the Red Bull KTM Factory Racing team for 2019, the young Argentinian is looking forward to the forthcoming season. The Abu Dhabi Desert Challenge commences March 30 in the United Arab Emirates. Saturday’s opening ceremony is followed by a 329.06-kilometre opening stage one on Sunday.